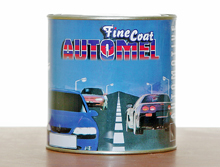 Finecoat Automel is an Automotive Refinish coating avaliable in Primer, Finish/Enamel and Varnish. The complete paint system offers a long lasting protection and beauty on vehicles. It comes in a wide range of very glossy and weather stable colors. © 2013 CHEMSTAR GROUP. All Rights Reserved. Website Developed by Design Streams.